Sky-high history. Tisbury town hall steeple is structurally weak and will be taken down for replacement this winter. 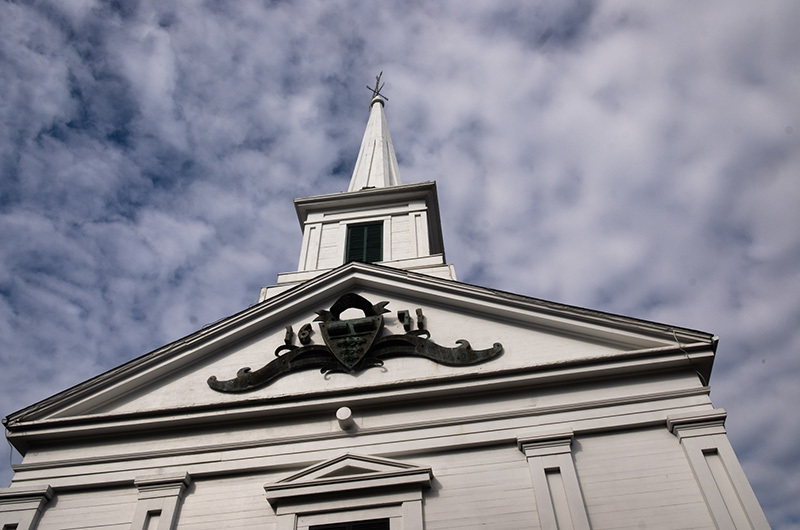 Amid mounting concerns about its structural integrity, the historic steeple that stands above the Tisbury town hall will be removed next month, the town facilities manager Kirk Metell said this week. “I’m excited,” Mr. Metell said of the project, which will involve the use of an off-Island crane company and temporary closure of much of Spring street. “It’s a very important project with a lot of history,” he said. The steeple will be removed beginning on Dec. 1, Mr. Metell said (earlier plans to begin the work between Nov. 9 and Nov. 12 were changed). The bell and weathervane will be removed first, then the steeple will be lifted into a flatbed truck. 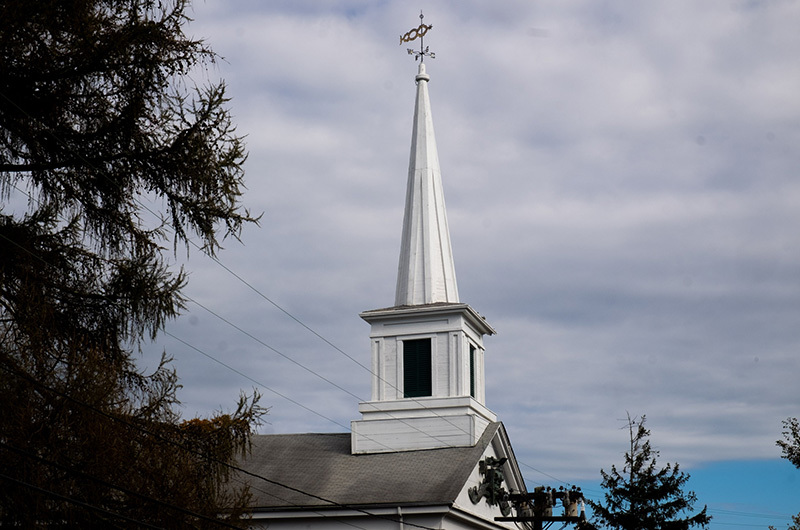 The steeple will be taken to a spot near the Department of Public Works building on High Point Lane where it will be kept until the town sells or otherwise disposes of it. If everything goes according to plan, the bell and weathervane will be preserved, Mr. Metell said. The weathervane was made by the well-known late Island metal craftsman Travis Tuck. Meanwhile, the town hall will be steeple-less for the winter while the town puts out bids for construction of a new, much lighter version. Mr. Metell said the Tisbury historic commission is requiring a replacement to be obtained within two years. He said the roof of the building is solid beneath the steeple, and only minimal patching will be required to make the building weatherproof. The classic New England-style town hall was originally a church and dates in 1844. Today it houses town offices on the lower floor and the Katharine Cornell Theatre on the second floor. The church was originally one story, but sometime in the late 1800s the building was raised to create a second floor beneath the original one. The new first floor housed town offices and the fire department. The town bought the property in 1920 from retired whaling Capt. Gilbert L. Smith, who had also been a selectman. In 1971, the building underwent extensive restoration funded by a gift from the Peter C. Cornell trust. Maybe I am confused. We are making Santander or buyer put historically correct roof on the old bank building, but allowing aluminum or fiberglass to go on a historic town treasure. Where is the public outrage we saw about clay tiles vs. asphalt? The wooden steeple and bell were removed from the Tisbury town hall on Saturday.